In Dead by Daylight, you have several ways to improve your character. There is also a leveling system and secondly a ranking system that affect your character. Each character starts at Rank 20. However, the goal is to reach in rank 1. At the levels, you start as usual at level 1. Level and ranks depend on the blood points - the quasi experience points (XP). Blood points you collect again during the individual games. Your actions here have consequences and you get points for your practice. - Brutality: Based on the attacks and the destruction of the survivors. - Deviousness: Acting with cunning and offending equipment. 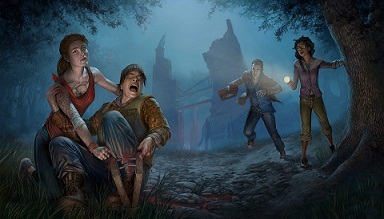 - Hunter: Find, pursuing and chasing the survivors. - Sacrifice: Sacrifice any survivors, will hang them on the hook and make other related to the entity actions. - Objectives: Based on the run. - Survival: Ensure your self-preservation. - Selflessness: Help others and cooperating with each other. - Bravery: Take risky actions and mock the killer. Then there is the Blood Web. It is virtually your skill tree, which you fill by using the blood points. For your character bonuses, perks, skills, items, or add-ons enable for this. However, each character has its own blood web, during which you collect the blood points for all the characters to be used. The blood web consists of nodes, with each node that you unlock, you will open up new branches. In order to rise in Level, you must complete your blood web. To increase the rank, you must indeed also collect blood points, but this is independent of the level. For the ranks you need to collect many blood points per match to reach the end of the game one of the points (pips) in the bar that you see below the categories after the match. You must achieve at least 3 pips and then you can rise in rank. However, for this you need a certain number of blood points. There should be at least 13,000 at the end of a match. The ranks can be reached a little more difficult than to gain levels. Your also can fall in ranking very quickly if you did not survive a few times. - Take a risk and free your teammates from the hooks for 1,500 blood points, This does not take long and you could also try it when the killer is in your immediate vicinity, since points are points. - You are the only remaining survivors of fours? Good, then let you guys go on a search for the trapdoor and get 5,000 points for escape. But, for example you can also visit the blood basement and hide there in a closet. Because the longer you're in there, the more points you can get - up to 3,000 are already in it. Check out the killer if he is not close by, then you can still go out and search the trapdoor to escape after a certain time. Even killers can farm blood points to increase their rank and level.